You’re 6 weeks away from test day and it’s time to get serious. Very serious. Hopefully up until this point you have already gotten involved and familiar with USMLE Step 1 material and test structure. Maybe you’ve gone through First Aid, gotten started with UWorld questions, or started using a USMLE prep platform like Osmosis or Pathoma, but now it’s time to buckle down and make sure you’re ready. So, let’s get into it. USMLE Step 1: The 6-week Study Calendar is our most intensive and aggressive timeline for Step 1 intended for strong students who score within ~20 points of their target score on initial baseline assessment. As noted before, most students have completed 2-4 weeks of dedicated studying prior to beginning this calendar. This schedule requires 12+ hours of studying every day (with the exception of afternoons off after NBME assessments). Flashcards are the students own – putting in the time to create a personalized study resource is worth the effort in the long run. Morning: First Aid– Students should read through each section twice during the days allotted for that topic. The baseline assessment is critical to pressure test whether the 6-week calendar is right for you. If you’re within ~20 points of your target score, then this is the calendar for you. If the final assessment is not within ~5-10 points of your target score, we typically recommend considering delaying your exam for further review. 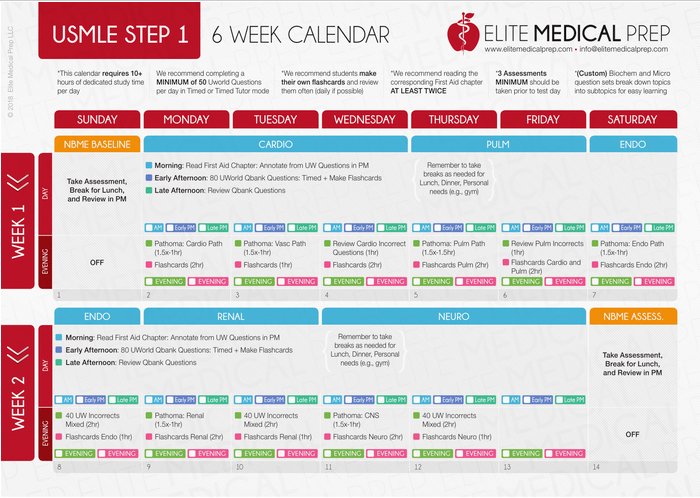 Download our FREE USMLE Step 1 6 Week Study Schedule here!